Where Do We Buy Our Land? Along with targeting land at bargain prices, we also want to make sure that clients and investors are able to maximise future growth. In order to do this we have let the maxim "Location, location, location" be our guide. There are many places across the USA where you can purchase distressed land and property assets. There are several companies selling these as potential investments. These are in places like Detroit, for example, which suffered the worst of the recession due to the reliance on the motor industry. Cities like Detroit often have complex social issues, such as high unemployment and crime, but with low economic growth. In the very long term, it is hoped these issues may be resolved, but even during the economic heyday of the last decade, these locations had little or no reputation as places for international investors to buy property. 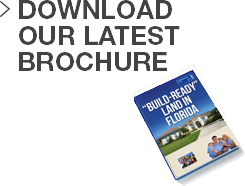 Florida has the largest overseas ownership of property in the USA. More non-US citizens own a property there than anywhere else in the country. This is mainly due to "Florida the tourist destination" more than anything else, with people buying a "home in the sun". This means Florida is set up to cater for non-locals buying into their communities. Due to the high prevalence of the timeshare industry in Florida, a great deal of work has been done to ensure that the state protects those purchasing properties. All realtors require a license to sell properties in the state and the system is well regulated to protect consumers. Florida has one of the largest populations in the United States, behind California, Texas and New York. It also has one of the highest growth rates in populations. Projects by the US Census Board suggests that within 18 years population in Florida will grow to nearly 30 million (from around 16 million only a few years ago). Tourism is the backbone of the Floridian economy. It is one of (if not the) most visited destinations anywhere in the World. Domestic and international tourists topped nearly 90 million in 2011, and this was during a period of economic difficulty. But there is more to Florida than that. As the home of NASA and the high-tech aerospace industry along with agriculture and the famous Florida oranges there is much more to the economic mix. Coupled with the oil industry on the Gulf Coast and the fact that Florida is the main trading gateway with the growing economies of South America there is much to be positive about for the state, now and in the future. This means that a place like Florida offers our clients a great deal of scope to decide how they wish to make use of their purchase. 1. You can look into buying the land and then selling again in the near future (say a couple of years) in order to leverage movements in the local land market. This would be the cheapest option and would only require a minimum initial land purchase plus the couple of hundred dollars annual taxes and administration fees. 2. It is possible that you can realise a good profit from the land (through the adding of value) by building a property on the plot and then selling it after a couple of years. It is spectulated that this would be the quickest way to realise a gain. 3. You can build a home and then use it, holding onto it as a personal vacation property. You may even let the property as a villa for others to use, and make an on going income.